Listed below is a sample of my 2018 Defensive Back Rankings for IDP Redraft Leagues. I will update these sample rankings periodically during the off-season to reflect changes in free agency, defensive schemes, playing time, draft selections, etc. However, keep in mind that the information listed here is just a small sample of a much larger set of rankings and descriptions that are accessible through purchasing my 2018 IDP Fantasy Football Draft Guide. Defensive backs have the most variability in point production from year-to-year. In other words, your top 20 defensive backs in 2018 could be quite different from your top 20 defensive backs in 2017 (especially in "big play leagues"). Much of this variability is because defensive back production is often dependent on the performance of the team's front seven. Additionally, the proliferation of nickel and dime sub packages have increased the number of defensive backs seeing 70%+ of the team's weekly snaps and made the position even more difficult to project from a fantasy perspective. This said I find it hard to use one of my first defensive picks on a defensive back. In reality, there are very few "locks" at the fantasy DB position outside of the first couple of tiers. Therefore, I usually try to grab a solid veteran fantasy producer (like Antoine Bethea in recent years) to serve as my anchor player and round out the position with young, upside talent in high leverage roles. This strategy affords me the luxury of using higher draft picks on other defensive positions where their projected performance is more accurately predicted. Collins have back to Earth slightly over having a MONSTER 2016 season. He missed the last two games of the year after breaking his forearm. All reports indicate he will be 100% for the season of the season, which eases any injury concerns. Despite the team bringing in Alec Ogletree at linebacker, there will still be a ton of tackle opportunity for Collins who is utilized often as an extra run defender. Jones finished as fantasy's top defensive back a year ago (a feat he accomplished back in 2015 as well) and should be the next safety taken off the board after Landon Collins. The only thing keeping this do-everything safety out of the top spot is the fact the Dolphins figure to have an improved front seven which could end up limiting Jones' tackle production. In just two years, Neal has already established himself as one the league's more intimidating safeties and has satisfied expectations of those labeling him the next Kam Chancellor in Atlanta's defense. He's one of fantasy's most consistent tackle producing defensive backs, registering four or more solo tackles in every game except one last season. He shouldn't be counted on for any interceptions but he does have 8 forced fumbles in his short career. Very dependable DB1 who sits just outside the first tier of fantasy backs due to the aforementioned lack of interception production. Byard tied for the league lead in interceptions with eight a year ago, an impressive feat for a second year player who had zero turnovers generated coming into the season. Despite producing 87 total tackles, Byard only compiled more than five solo tackles twice in game last year. So he's going to be big play reliant and therefore a bit riskier than the rest of the backs in this draft range given he's relatively new to the DB1 category. Baker was forced into a starting role mid-way through his rookie season due to injuries within the Arizona secondary. On a per snap basis, Baker led all defensive backs in tackles with 14.5% tackle rate (nearly three percentage points better than the next nearest safety, Reshad Jones). With old Defensive Coordinator James Bettcher in New York now, the Cardinals' safeties probably won't have as much fantasy value. However, Baker's versatility will ensure he has a high snap count and is continually around the ball. He probably has the highest upside in this tier. Hyde was one of last year's best off-season signings. He's a solid tackler and excels in pass coverage which has resulted in fairly well-rounded box score production from the sixth year player out of Iowa. The Bills are depending on a rookie to lead their linebacking crew which could result in more tackle opportunity for Hyde this year and he always has the benefit of the league's most generous home stat crew. Continue to view him as a top 10 DB in virtually all scoring systems. Davis was one of the NFL's more consistent tackle-producing safeties in 2017 - registering four or more solo tackles in nine of his last 13 contests. The Steelers linebacking core is still relatively weak after the losses of Ryan Shazier and Lawrence Timmons which should help keep Davis' production fairly constant to year ago. Smith is annually drafted as a high-tier DB1, but he's not quite as good of a fantasy producer as he is on-the-field performer. He salvaged his value last year with five interceptions but hasn't produced 70+ solo tackles since 2014 and is becoming more big play reliant, especially as the Vikings' defense tends to limit their own tackle opportunity. Adams got off to a bit of a slow start to his rookie season but his play improved during the second half of the season. I believe he will carry that momentum into 2018 and is well primed for a DB1 sophomore season playing on a Jets' defense that should see plenty of tackle opportunity this year. A 75/25 tackle line is within reach for this prototypical in-the-box safety out of LSU. Much like Budda Baker, Jones was forced into a starting role during his rookie season after Morgan Burnett went down with an injury. With Burnett now in Pittsburgh, Jones will be the starter heading into the season and well positioned to pick up where he left off in 2017. The Packers are weak at the linebacker position especially after the season-ending injury to Jake Ryan, so there's a good chance Jones will see some linebacker snaps again this season. DB1 potential if the chips fall where we think they are going to for Jones. Like what you've read so far? Looking to dominate your 2018 Fantasy Football draft(s)? 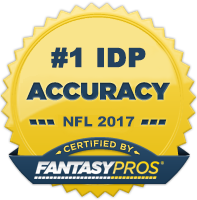 For $6.99 you can get complete access to The IDP Guru's comprehensive and exhaustive 2018 IDP Fantasy Football Draft Guide.